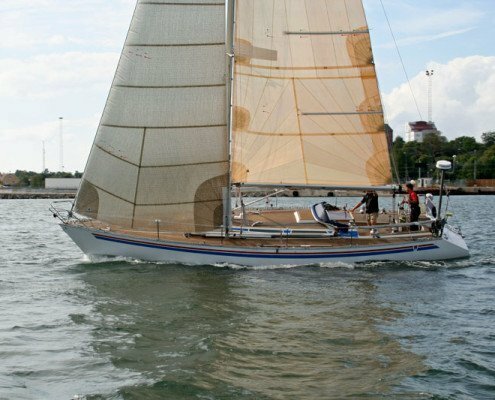 Both Wasa 55 and Wasa 30 were fast boats but if you wanted to compete in major offshore races, for exemple Gotland Round then these boats hade no chance because of the IOR rule, which dominated unlimited. Together with the brothers Bennet and Bertil Törner, Leif Ängermark developed the Wasa 410. Approaching the IOR without losing too much of Leif’s demand for a modest relationship between length and width. Wasa 410 was designed as a fast sailor but got Wasa’s traditional comfortable interior decor, something that family sailors appreciate. Wasa 410 was a cruiser/racer long before that term was found. 50 boat has been manufactured, shipyard built as well as layman made.